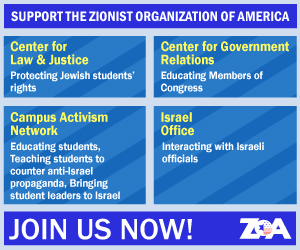 The Zionist Organization of America (ZOA) is supporting recent calls for the United Nations to recognize the plight of the 800,000 Jews of Arab lands who were variously attacked, intimidated, dispossessed, expelled and pressured to leave their ancient homes in Arab lands in the wake of the 1948-49 Arab war against Israel. The international community has long fixated on the 350,000 to 650,000 Palestinian Arabs who left the territories of what became Israel during the 1948-49 war to destroy Israel, which they and neighboring Arab armies initiated in 1948, but have been largely silent about the plight of the 800,000 or more Jews that were forced to leave their homes and dismantle their often ancient communities under threat of death, massacre, persecution and intimidation. Now, the head of Jewish communities that left Arab countries are demanding UN recognition of their plight, which includes lack of compensation for the loss of homes, businesses and all other assets seized from the departing Jews, most of whom were unable to take virtually any of their possessions with them. Following the Arab defeat and the emergence of Israel in 1948, Arab governments and societies turned on their Jewish communities, stealing their properties, engaging in pogroms and intimidation and legislating to strip them of any rights, resulting in most Jews from these countries leaving their communities. 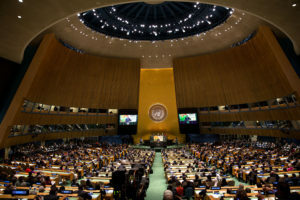 In a letter to UN Secretary General António Guterres, community leaders, among them Dr. Shimon Ohayon, Director of Bar-Ilan University’s Dahan Center and Chairman of the Alliance of Moroccan Immigrants wrote, “While the UN organizes events to mark the departure of 450,000 Palestinians from Israel upon the establishment of the state, following a war imposed on Israel, we do not see recognition of the expulsion of Jews from Arab countries … We believe the UN strives for justice for all refugees around the world, including Jewish refugees who were expelled from Arab lands. We therefore seek to establish a memorial day for the Jews’ expulsion from Arab lands” (‘Jews Expelled From Arab Countries Call on UN to Recognize Their Plight,’ Algemeiner, November 28, 2018). ZOA National President Morton A. Klein said, “It its truly extraordinary and an outrage that the plight of Jews from Arab lands has never been a point of international concern and action, unlike the Palestinian Arabs who fled Israel largely on their own mainly as a result of a war to destroy Israel which they had initiated in defiance of the UN General Assembly resolution of November 29, 1947 calling for the partition of the British Mandate of Palestine into Arab and Jewish states. “Unlike the Palestinian Arabs, the Jews of Arab countries indulged in no aggression against their neighbors, were peaceful people and communities and only asked to be left in peace. “Instead, as a result of the UN Partition resolution which encompassed Jewish statehood which Arabs refused to accept, and particularly following the Arab defeat and the emergence of Israel in 1948, Arab governments and societies turned on their Jewish communities, stealing their properties, engaging in pogroms and intimidation and legislating to strip them of any rights, resulting in most Jews from these countries leaving their communities. “In the case of Iraq, the Jews had to leave a community that had flourished for 2,500 years, the community having been established long before the Arab conquest of present-day Iraq. “It is high time that the terrible injustice, persecution, discrimination and dispossession of the Jews of Arab lands is internationally recognized and measures taken to award them compensation.